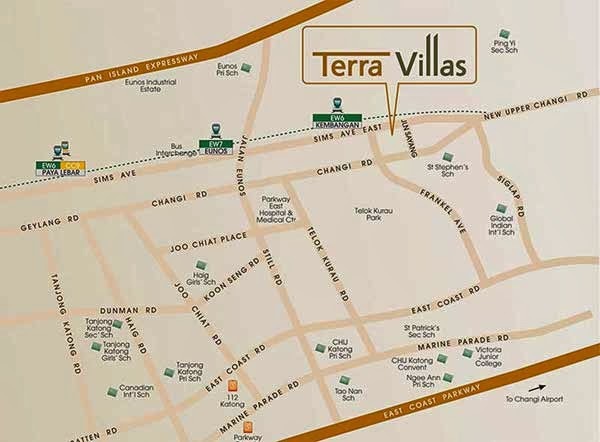 Terra Villas @ Kembangan is located at 23 Jalan Sayang Road Singapore 418642 in District 14. Nestled in a low density with low rise condominiums and landed property, an address in Terra Villas soothes each resident soul, revive energy, simply a place for retreat. The distinguished district of Kembangan is your home sweet home, East Coast Park is your playground with all the weekend exercising and dining options.. Nearby renowned schools include Maha Bodhi School, Haig Girls School, Ngee Ann Primary, Eunos Primary, Manjusri Secondary, Victoria and many more. Terra Villas is well accessible via MRT. Nearest MRT is Eunos MRT and Kembangan MRT which links to you all parts of Singapore in a breeze. Download Terra Villas Floor Plans or brochure here. *Terra Villas VVIP Preview is available strictly by Appointment. Showflat opening hours may varies. For opening hours, do call our Sales Hotline at 6100 0877 or register below for your VVIP Preview.